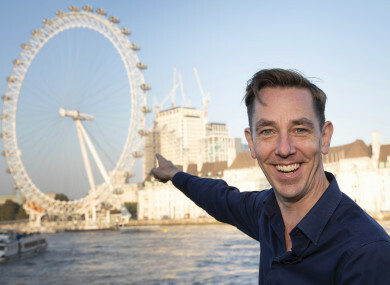 Ryan Tubridy visits The London Eye ahead of The Late Late Show. TOMORROW NIGHT, THE Late Late Show will be broadcast from London in front of a crowd of 1,200 people and Ryan Tubridy is nervous – “very nervous”. Tubridy will also present his radio show from London today and tomorrow before his TV show kicks off at its usual time of 9.35pm on RTÉ One. Over 15,000 people applied for tickets to the show – just 1,200 secured a place. But that’s enough for Tubridy who usually presents the iconic show in front of just 200 people. Asked about his nerves, he told TheJournal.ie: “I am very nervous – of course. People don’t believe me when I say I get nervous but I do. Every Friday. Tubridy explained that there is a great expectation on him to perform because of the large crowd and the cash that RTÉ has spent in moving everything across the Irish Sea. “Because of how big this is there are great expectations for this and I will be nervous but that’s part of the human condition… but it’d be strange if I wasn’t. “This is my first time doing it outside RTÉ – we’ve only ever done it here for the last 10 years. “This is a venue that has an audience of 1,200 people. That’s big – that’s intimidating in terms of numbers. Tubridy explained that the London show was “timely” given the Brexit debates and that it was meant to be extending the hand of friendship across to those in the UK. He added: “London is timely because of Brexit – this is having an effect on people and their moods and their attitudes. We felt the Irish presence in the UK is strong that we wanted to put a hand out and say the economic situation might be falling apart around you but the ties that bind us are still very strong. Email “'Nervous' Ryan Tubridy prepares for Late Late Show in London with 1,200 audience members”. Feedback on “'Nervous' Ryan Tubridy prepares for Late Late Show in London with 1,200 audience members”.